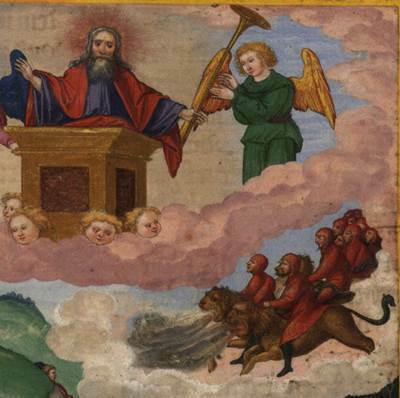 When the sixth trumpet sounds the second woe, an angel next to the golden altar in the heavenly temple of God commands the angel of the sixth trumpet to release of four bound angels at the Euphrates River (Rev 9:13-14). When the Bible speaks of confined or bound angels, it is always in the context of fallen evil angels (Luke 8:26-31; Matt 8:28-32; 2 Peter 2:4; Jude 1:6-7), and they are not from the abyss. They command armies of horsemen numbering two hundred million; however, death is not by the riders. Instead it is by the three plagues that proceed from the horses’ mouths and tails (Rev 9:16-19). After God's wrath has taken effect, the surviving human beings do not recognize that the supernatural plagues confirm the existence of God and are unrepentant (Rev 9:20-21). This indicates that there are no longer any Believers on earth; thus, there is no one left to evangelize and testify of God.